Olive green ‘Viva Vhari’ jumper from French Connection. 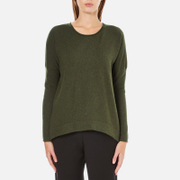 Crafted from a sumptuously soft cotton and wool knit blend, the sweater comprises a round neckline, long sleeves with dropped shoulders and a hi-low front hem. Complete with an inverted knife pleat to the rear. 51% Acrylic, 27% Nylon, 12% Cotton, 6% Wool, 4% Elastane Model is 178cm/5'10 and wears a size S.